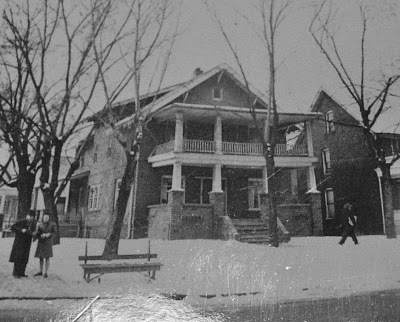 This is a shot my mom recently unearthed of the building my grandparents owned at 1501 Detroit Street in 1945. It was few blocks from Welch Blvd. on what is now Martin Luther King Ave. 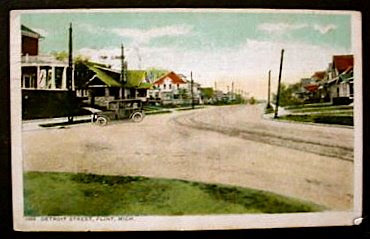 The building was just a few blocks north of the intersection in this postcard. This is the general area today on Google Maps. Labels: 1501 Detroit Street, Flint Photos, houses, Leone McFarlane, Martin Luther King Avenue, Pat Young, Verne McFarlane, Welch Blvd. What a great house! Do you know anything about its history - when it was built, who all lived there, what happened to it, etc.? Any idea who the people are out in front? Not sure about the people on the street in the photo, but a Polish guy was a long-time tenant. My grandpa would sometimes help him out with rent. When he died, he left all his possessions to my grandpa, including his Michigan license and his gun, which my mom still has. I look at this photo, and the earlier photos of the grand old houses, and I get weepy. 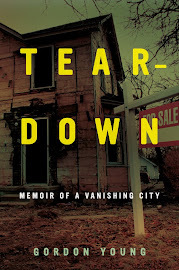 It seems just such a terrible shame that a community dies, and the skeletal remains are the houses, falling into disrepair. The images speak volumes to me about lost hopes and disconnected familes. I'm encouraged though, by the modern post-urban homesteaders, who are buying up abandoned lots and homes in Flint and Detroit and trying to make a go of it. If I weren't such a chicken with my money, I would try the same. I think some people from France lived there in the late 50's.Emile,Jeanette,and a young son,Dan i think.Cant remember last name. Anonymous, my mom remembers her dad talking about the French people. And the name of the previous person who lived there was Constanty F. Roman. Did you live nearby? Love to hear more details about the neighborhood. I can't resist joining in on this discussion any longer. I have 2 questions for interested readers. 1. Does anyone remember a Dr. Wark who lived on west side of Detroit Street in the area of 1501. His practice was in his home and his ancient white haired wife was the nurse. I remember the cracked porcelain sause pan she boiled the needles in. 2. I used to peddle up to a pet store on the east side of Detroit Street near 1501 to sell Hamsters. The owner would give us 25/cents each for Hamster babies. That could amount to $2 or $3 for a good litter. A few more memories...I worked part time for Royal Photo Service on Detroit Street near this house, which was owned by my dad. In lived 1 block over at 1502 Garland up through 1952 and into my 4th year of age. This house seems so similar to ours( only viewed from the family pictures as I was too young for any real memories),to look at it is like returning home again . Down the other side of Detroit street(MLK) up towards Welch BLVD from where your Grandfather's house stood was the Buttercup Bakery. Best nutty donuts ever made way before DAWN! My Parents shopped their through the late 60's. If you look fast during one of the street scenes from "Rodger & Me", sadly you will see the burned out shell of the Buttercup. I grew up three blocks away at 1644 Mason St. I used to stop at the Buttercup Bakery when delivering the Free Press in the mornings.